Overview - The debut feature by the great Andrei Tarkovsky, Ivan’s Childhood is a poetic journey through the shards and shadows of one boy’s war-ravaged youth. Moving back and forth between the traumatic realities of World War II and serene moments of family life before the conflict began, Tarkovsky’s film remains one of the most jarring and unforgettable depictions of the impact of war on children. A booklet featuring an essay by film scholar Dina Iordanova; "Between Two Films," Tarkovsky's essay on Ivan's Childhood; and "Ivan's Willow," a poem by the director's father, Arseny Tarkovsky. Childhood is supposed to be a time of joyful abandon, free of the weighty pressures and tragic realities of adult life. It's supposed to be a time of curiosity and growth and simple pains. Unfortunately, for the title character in Andrei Tarkovsky's 'Ivan's Childhood,' it proves to be anything but. Faced with the cruel horrors of war, a young boy is forced to leave his youth behind. Marked by dreamy imagery and stylized visuals that blend stark realities with poetic embellishments, the film weaves a somber and affecting examination of lost innocence. During World War II, a Russian orphan, Ivan (Nikolai Burlyaev), befriends a group of Soviet soldiers. Though they originally use him as a spy against the Germans on the Eastern Front, the officers grow worried about his safety. Fearful that he might be caught, they decide to send him to military school where he will be spared from the dangers of the battlefield. Fueled by a thirst for vengeance, the stubborn boy refuses to leave and instead remains determined to aid in the war efforts, no matter the consequences. When we are first introduced to Ivan, it's through a tranquil flashback/dream sequence that sees the lad literally soar through the sky. Happy and unburdened by the hardships to come, the boy wears an enthusiastic smile on his face. When we soon cut to the narrative's present reality, however, we realize that this smile has long since faded. Dirty, thin, and world-weary, it's clear that the poor child has gone through hell. Actor Nikolai Burlyaev plays the character with a no-nonsense maturity that belies his young age. Temperamental and eager for revenge against the enemy, Ivan has been hardened by his experiences, and the actor does an incredible job of revealing the heavy trauma that burdens his soul. An important stepping stone in Andrei Tarkovsky's evolving style, the movie features many aesthetic components that anticipate the director's subsequent efforts. Still finding his voice as a filmmaker, there is a sense of experimentation here, and as pointed out in the included special features, it's interesting to see the early stages of certain cinematic elements that he would later expand upon or conversely abandon. To this point, while it's not as frequent as in his later work, the film makes notable use of sustained shots and minimalist sensibilities. Likewise, the director takes advantage of the entire frame, filling the foreground, middleground, and background with activity, frequently shifting the visual emphasis throughout the layers of the screen. One scene, featuring an officer trying to woo an army medical assistant, features some particularly memorable camera work. As the soldier stalks his romantic prey through a dreary woods filled with fallen leaves, the camera itself seems to embark on its own game of cat and mouse with its subjects. Slowly tracking through the trees, the image will reframe from individual close-ups and medium shots, to two-shots -- elaborating on the dueling physical and emotional space between the characters, bringing them further apart or closer together through careful compositions and deliberate movements. The sequence then ends with a rather striking image, focusing on the officer as he dramatically kisses the woman, her feet literally suspended in the air over a trench. The rest of the runtime is filled with similarly arresting visuals, and Tarkovsky brings a slightly stylized sense of poetry to the film's shadowy indoor spaces and battle-ravaged landscapes. These desolate war-time settings carry a haunting sense of apocalyptic decay. The movie's climax, set on a marshy river illuminated by constant bursts of enemy flares, is especially powerful. Acting as a surreal counterpoint to these dreary sequences, are occasional peeks into Ivan's idyllic pre-war memories and fantasies. These ethereal flashbacks mostly take on a kind of wistful serenity, though tiny bits of nightmarish brutality sneak in as well -- revealing the character's heavy losses. Filled with lyrical flourishes, the dreamy imagery clashes perfectly against the stark horrors of the combat zone. Guiding the audience through the past and present, Tarkovsky alternates between smooth and jarring editing transitions that bridge scenes together through emotional associations. Sound also plays an integral part in the experience, and beyond the use of isolated effects to bolster ambiance, the audio is used to further blur the line between time periods. This all leads to a faintly disorienting experience that intentionally keeps the audience on their toes, and there are instances when it isn't immediately clear exactly where or when we are in the story. Even when simply cutting between scenes set during the war, the director often skips seemingly important narrative beats, forcing viewers to fill in the blanks for themselves. Though impeccably shot and thematically potent, the film does demonstrate a few minor stumbles. The nonlinear storytelling is effective, but there are times when certain scenes feel disconnected and listless. Subplots that don't deal with Ivan are particularly troublesome, and while interesting on their own, these detours ultimately add up to very little. Like most of Tarkovsky's work, the movie is also on the slow side. This contemplative tempo works beautifully in his subsequent works ('Solaris'), but here the pacing feels a little uneven. Of course, this was the director's first feature length effort, and all things considered, it's a genuinely commanding piece of filmmaking. Featuring the stylistic beginnings of an important figure of world cinema, 'Ivan's Childhood' is both emotionally absorbing and cinematically arresting. Through the story of a war-ravaged young boy, Tarkovsky reveals a youth marred by anguish and devastation, illuminating the deeper horrors of combat. While childhood is supposed to be a carefree beginning toward greater ends -- as the film so tragically reminds us, in this world, things are so rarely what they're supposed to be. 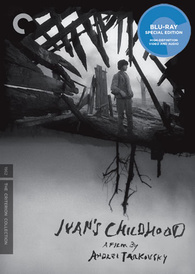 Criterion presents 'Ivan's Childhood' in their standard clear case with spine number 397. The BD-50 Region A disc comes packaged with a pamphlet featuring an essay by film scholar Dina Iordanova, an essay by Andrei Tarkovsky, and a poem written by Arseny Tarkovsky, the director's father. The film is provided with a black and white 1080p/AVC MPEG-4 transfer in the 1.33:1 aspect ratio. With the exception of a few very minor quirks, this is a nicely detailed and pleasingly filmic picture. The source print is in very good shape, but there are a few negligible specks and scratches, along with an odd shot here and there that look comparatively rough (including some archive footage near the end). A light layer of fine grain is present throughout, lending the image a natural sense of texture. Clarity is sharp, showing off all of Tarkovsky and cinematographer Vadim Yisov's thoughtful compositions. The stylized war-torn locations come through with impressive dimension. One can even make out every fallen leaf on the ground and every inch of dirt and grime on Ivan's face. White levels are nicely balanced, and bright scenes offer strong contrast. Unfortunately, the only real downside to the image involves some noticeably elevated blacks that tend to look a bit washed out and flat in darker sequences. Sharp and nicely preserved, 'Ivan's Childhood' looks quite good on Blu-ray. The impressive, dreamy cinematography is rendered beautifully, and outside of some less than ideal black levels, there really isn't much to complain about here. The audio is presented in a Russian LPCM mono track with optional English subtitles. Despite its single channel limitations, this is a surprisingly immersive mix that features some impressive sound design choices. Dialogue is clear and full throughout, remaining free of the thin, boxy quality that plagues some other mono tracks from the time period. Tarkovsky likes to isolate and repeat specific effects to add subtle ambiance and aural subtext to his scenes, heightening the atmosphere through important background sounds. Crackling fire, dripping water, creaking doors, soft footsteps, and a cooing cuckoo all add a delicate sense of place and mood to the proceedings. Fidelity is crisp and range is solid, giving the film's score room to breathe without distortion. With that said, explosions and gunshots carry a muted presence (compared to modern efforts) and low frequency activity is negligible. Thankfully, there are no crackles, hissing, or pops. Tarkovsky makes the most of the single channel mix, reinforcing the poetic visuals through similarly artistic but subtle sound design. Criterion has put together a solid but fairly slim assortment of supplements. The extras are all presented in upscaled 1080i with Dolby Digital 1.0 audio and optional English subtitles for the Russian portions. Life as a Dream (HD, 31 min) - Here we are treated to an extensive interview with film writer Vida T. Johnson. Johnson details the movie's place within Russian cinema and the director's evolving style. She also analyzes the film's visuals and editing, rounding out an informative and thoughtful discussion. Nikolai Burlyaev (HD) - Five brief interview clips recorded in 2007 with actor Nikolai Burlyaev are viewable separately. They are, "Lead Role" (2 min), "Screen Tests" (1 min), "Finding Tears" (3 min), "The Shoot" (1 min), and "True Patriot" (3 min). Burlyaev describes how he got the part of Ivan, and details what it was like to work with Tarkovsky. Vadim Yusov (HD) - Four interview clips with the film's cinematographer are also included. They are, "Visual Language" (3 min), "Preparation" (4 min), "Dreams" (2 min), and "Texture" (3 min). Yusov elaborates on Tarkovsky's visual style and discusses their working relationship and collaboration process. Tragic and absorbing, 'Ivan's Childhood' is a striking examination of war-torn youth. Filled with stark, poetic images and wistful excursions into memory and dream, the film leaves a lasting cinematic impression. The video transfer and audio mix are both very strong, and are thankfully free from any major technical issues or age-related hiccups. Special features are on the slim side, but the included interviews are well worth your time. This is a powerful film and a well produced disc from Criterion. Recommended.